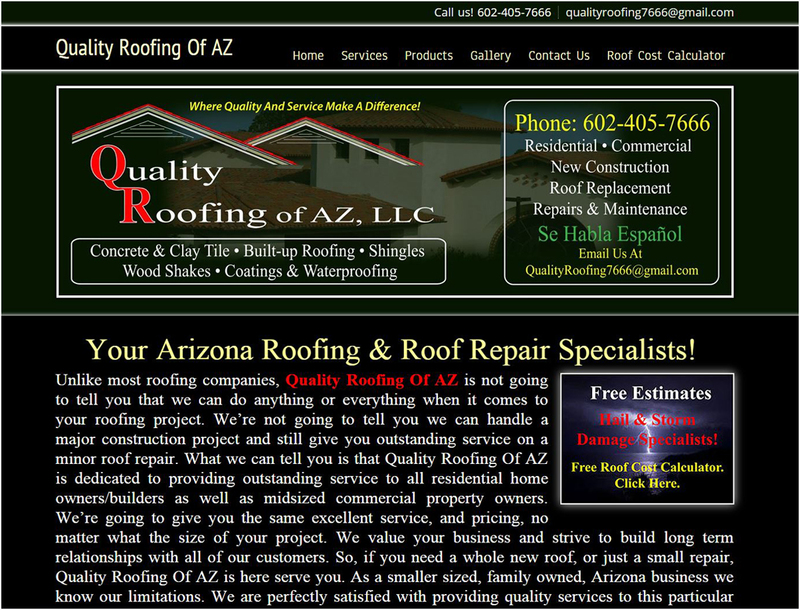 Quality Roofing Of AZ owner, Heriberto Agredano, recently asked us to design a website for his new roofing company. Heriberto had a limited budget but didn't want to sacrifice the quality of his new website. He had looked at several of the DIY website design services available as well as the services of other local custom designers. After our meeting with him he selected BG Services AZ as his website designers. We worked with him on the design and content. We completed a custom website that accurately depicts his company image and it's services yet fell within his limited media budget. Key to the success of this design was that he was able to take advantage of our Year End Sales Event which gave him a 40% discount on the new design. The Quality Roofing Of AZ websites are complete and active on the internet. In addition to the standard website in English, we also created a mirror website in Spanish. The owner and I have a long term friendship that spans over 15 years. I know the quality of his workmanship and strongly recommend him to anyone needing a new roof, roof repairs, roof maintenance and more.